This blog post is based on a keynote I gave recently at the 2019 SSIR Data on Purpose event. Are you optimistic or pessimistic about data as a tool for good in the world? Over the last few years I’ve seen the shift in answers to this questions. People used to answer “optimistic”, but now most people indicate some mix of emotions. You’ve probably seen the Gartner hype cycle with its suggestion that a technology receives inflated expectations and then is overused to the point of disillusionment. I’d argue that the over-hyping and the disappointment happen at the same time… that time is now for social good organizations that are trying to use data to further their missions. The response I’ve been crafting focuses on acknowledging the damaging history of the data practices we routinely employ, taking a step back from hype-driven roll-out of data programs, and working to align your data and your mission. The Data Culture Project, my collaboration with Catherine D’Ignazio, works with organizations large and small across the world to help make that happen. One of the core problems in creating a data culture that aligns with your mission is the history we are fighting against. Data has been a tool for those in power to consolidate that power for centuries. For organizations working in the social good sector, this shouldfeel problematic! If you’re deploying some tool or process, you need to be wary of any pieces that reinforce that history. They can cultivate the opposite of the empowerment, engagement, and ownership goals that are probably at the heart of your mission. Warning: In this post I’m going to depress you by reviewing some of that history. Don’t worry, I’ll close with some inspirations so it isn’t all doom and gloom. Make sure not to stop reading in the middle, otherwise you might walk away feeling pretty bad about the world! I won’t surprise anyone by talking about human history as full of stories of those in power seeking to oppress others. However, I want to highlight a few of those instances that were data-driven. Going back as far as the ancient Egyptians, we can find evidence that they tabulated and tracked populations to determine how much labor they would use to construct their giant monuments to themselves (read more at the UK Office for National Statistics). They created census data to drive massive construction projects in their own likeness. Fast forward to Britain in the 1700s and you find the horrors of the slave trade via cross-atlantic shipping; all cataloged in stunning details by the shopping industry and the strict regulations they were under. Many of these massive data records are still available today. This economic data numerically catalogues the human suffering of tens of millions at the hands of those in power across the western world. Next consider another of the darkest times in recent history – the Nazi regime. Their massive atrocities were informed and guided by the tabulations of their census, driven by IBM’s custom manufactured counting machines (read more on Wikipedia). This is a history IBM would like us to forget with their new Watson AI initiatives, but Watson was in fact the one that oversaw all this work as CEO at the time. A few decades later we find another example in South America, recipient of massive investment and development packages from large multi-national UN-style agencies. All this drove numbers that showed enormous economic growth, while in fact huge populations were suffering. As famed author Eduardo Galeano writes – “the more watched and desperate the people, the more the statistics smiled and laughed”. As for our current times? You can barely throw a stone without hitting another story of a large centralized technology company using some data in morally questionable ways. Amazon pitching facial recognition to ICE here in the US to keep migrants and asylum seekers out (The Verge), Facebook building massive datasets about non-users to improve their invasive advertising targeting (Reuters), China creating a “social credit score” to control and guide citizen norms (Bloomberg) – the dystopia is here. We are all quantized without any meaningful consent in the massive databases of the big tech corporations. I trust you’re on board now with the idea that data has a dark history full of examples like these ones that I’ve quickly touched on. Want more? Read Algorithms of Oppression, Weapons of Math Destruction, Automating Inequality, or one of the other recent books about this. I know, that was pretty depressing. Usually I don’t pull in forced labor, slavery, and the Nazi holocaust into one blog post. Sorry. This thing is, this is the past and present that your data process is living within. We can’t ignore it. You have to work hard to make sure you’re not part of it. To fight this history, first we have to understand the patterns that drove it. From my point of view, these are process problems(read more in my paper on with Catherine D’Ignazio). Ok, in some of the more egregious examples above these wouldn’t be described as “problems”, because clearly their goals were to actively oppress and kill the subjects of the data. However, that isn’t the goal of most data endeavors! The thing is, even many well-meaning, pro-social data efforts use this problematic process. Consider the history of public health and epidemiology to start. In 1663 you have John Graunt carrying out the first recoded experiments in statical data analysis; the ancestor of epidemiology (learn more on Wikipedia). By recoding information about mortality, he theorized that he could design an early warning system for the bubonic plague ravaging Europe. Definitely working for the social good, but in a position of power with no engagement with the effected populations. Extractive dart collection, a complicated statistical process, and no control of impact for the population in mind. Or how about the famed maps of John Snow, used to discover the origins of cholera in the early 1800s (learn more on Wikipedia). A noble, impactful, and meaningful example of data usage for sure – literally saving lives. The same process criticisms hold – a person of privilege mapping data about “the poor” to discover something without any role of the people that were the data themselves. When we quickly read these two stories, they sound like amazing historical examples of using data for good! However, when you examine them more deeply, you find the same four criticisms weighed above. Their data methods didn’t match their mission. Knowing this history, how do you make sure you’re not doomed to repeat it? So how do you avoid these pitfalls? You build a data culture within your organization that can do better. You empower staff up and down your org chart to identify problems data can help solve and them support them solving the those problems. You open up your process, you bring people together, you help them make decisions with data. You don’t need data scientists to to this, you need a data culture. This is what our Data Culture Project is all about. Here are some examples to help explain what I mean. A wonderful historical example is the recently re-discovered works of W.E.B. Du Bois. He pulled census data, among other sources, to create a catalog of “the African American” in 1900. He brought the inventive and novel infographics to the world’s fair in Paris to showcase the work that needed to happen to create true freedom in the US post-slavery (work that is still being done today). He worked with African American students at the university to repurpose this census data to tell their story. These graphics are an example of self-determination – highlighting the problems the subjects of the data themselves have chosen. His statistical techniques were detailed, but he invented new ways to communicate them to a larger, less data-literate audience. A general theme in my work is using the arts as an invitation to bring people together around data to tell their own story. 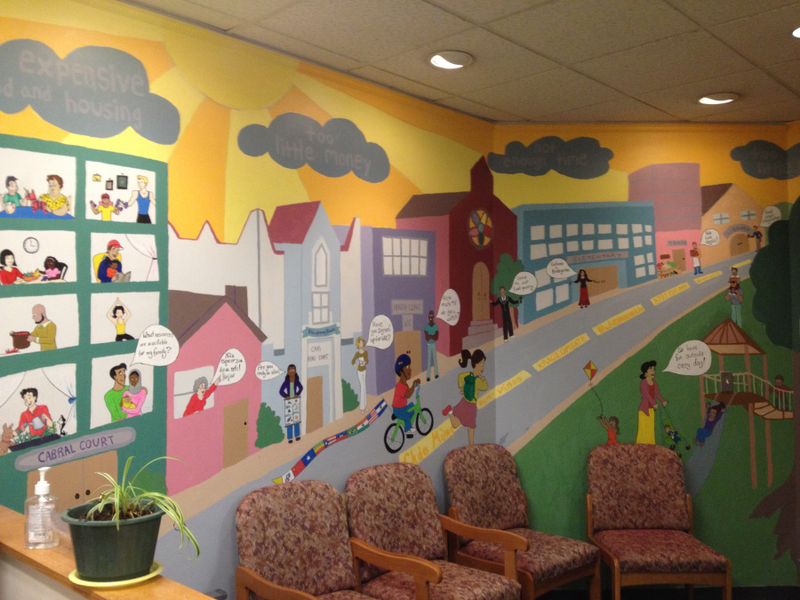 My work on data murals, a collaboration with my wife Emily Bhargava, is a prime example of this. We bring a group of people together around some data about them, help them find a story they want to tell, and then collaboratively design a mural to tell it. This puts the ownership of the data analysis and the data story in their hands, flipping the standard process on its head. The subjects of the data are empowering to tell the data story, with invitations to analyze the data that build their capacity and meet them where they are in skills and interests. A more community-focused example comes from the Data 4 Black Lives organization(D4BL). The brutal legacy of slavery in the US permeates our culture, so it should be no surprise that it continues to poison the datasets we use as well. D4BL is working to highlight these problems, bring together organizers, data scientists, and students, and also influence policy to put data in service of the needs of black lives in the US. This is a traditionally marginalized community empowering themselves with the language of those in power (data) and trying to build community in service of their own goals. For a non-US example, we can look to the work done by the Tanzania Bhora Initiative and Faru Arts and Sports Development Organizatio as part of the Data Zetu Intiaitive in Tanzania. They ran a competition for designers to create khanga cloth patterns based on data (the khanga is a traditional cotton clothoften adorned with sayings or shout-outs). The project built the capacity of designers to speak data, and ended with a fashion show showcasing the winning designs (read more in their blog post). The first place winner (Danford Marco) created a design to reflect that 1 out of every 2 married women have faced some kind of abuse from their husband. A staggering statistic, and a stunning design to bring attention to the problem. This kind of creative approach to building data capacity is an example of a very different process, one that is inclusive, builds capacity, and gives ownership of the data to the people it is about. I’m hoping by now that I’ve convinced you that you need to think harder about the data methods you use in order to avoid re-creating the terrible historical practice associated with data. I’m focused on organizations that work for the social good, but this argument holds true for anyone using data. The inspirational examples I highlight all paint a path forward that lets us match our mission and our methods. Which path will you follow? A few years ago I went to the first UN World Data Forum and made some amazing connections with non-profits large and small (read more about that here). A common theme at that event was how to help organizations and governments get the data they needed to start work on the Sustainable Development Goals. I just returned from the 2018 event, and found a new message repeated over and over – how can we help those who have data communicate about its potential and its impact? I’ll write more about that later. For now I want to share a bit about the session I ran with my collaborator Maryna Taran from the World Food Program (WFP). It was a pleasure to return to the event where we first met and speak to the impact we’ve had at WFP, and how the Data Culture Project has grown to a suite of 7 hands-on activities you can use for free right now. Our session was designed to focus on bringing the non-data literate into the data-centered conversation. The idea is that we can help these folks learn to “speak” data with playful activities that try to meet them where they are, rather than with technical trainings that focus on specific tools. We introduced our arts-centric approach to creating participatory invitations through the data cycle – from data collection, to story-finding, to story-telling. Specifically, we ran our Paper Spreadsheets activity and our Data Sculptures activity. Maryna also shared how the WFP has rolled out a data program globally, where the Data Culture Proect activities fit into it, and some of the impacts they’ve seen already. Participants filling in a paper spreadsheet. The Paper Spreadsheet activity led to a wonderful discussion of data types, survey question create, and security concerns. 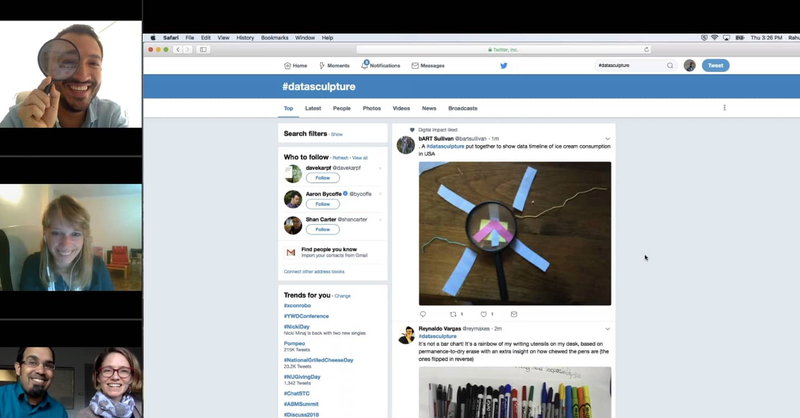 The Data Sculptures folks created were a great mix of different types of stories, so I highlighted some of the scaffolding we’ve created for finding stories in data. One of the most rewarding comments at the end was from a woman who worked on the data analysis side creating charts and such for her team. She noted that she often will share a chart with others on the team and they’ll say “tell me the story”, much to her frustration – she just didn’t understand what they meant. What more did they want than the chart showing them the evidence of the claim or pattern? She was pleased to share that after this session, she finally had a way to think about the difference between the charts she was making and the story that her colleagues might be looking for! Such a wonderful comment that resonated with a lot of the points Maryna was making about how and why WFP is rolling out the Data Culture Project activities in parallel with their more technical data trainings. Each spring I have the pleasure of teaching MIT undergrads and grad students in my Data Storytelling Studio course. It is a hands-on, projects focused course built around creating quick prototypes of data-driven stories that try to get an audience to do something. This year the course focused on climate change as the theme, as part of the Boston Civic Media intiative. I provide relatively clean datasets they can use, sourced from online portals and local community groups. Over the course of the semester they work on building charts, creative charts, maps, creative maps, data sculptures, and interactive data experiences. Checkout the newly published full course content on MIT’s OpenCourseware site. Here is a quick run-down of their final projects. Students in this group combined a few datasets to create a public event that motivated people to ask the city to plant more trees. They created the shadow of a “missing” tree on the ground and filled it with facts about the impacts and dangers to trees in the city. Visitors were invited to fill out paper leaves with their favorite tree stories and hang them on a tree the community built together. Their conversations with visitors illuminated how the public thinks about the tree canopy of the city, and how and why people were motivated to advocate for more. Read more about the project in their write-up. This group used data about bees populations to create a playground game for 2nd and 3rd grade students. The game helps them learn about why bees are important to us, and how to protect them. The kids enjoyed the game thoroughly, and made great suggestions for how to improve it. The quotes from the kids illustrated their drive to understand more fully how bees help our planet, and what they could do to help. Learn more about the game in their write-up. This group created a game visitors to a farmers market could play to explore data about how bees are moved around the US to pollinate crops in various states. Their goal was to engage the visitors in advocating for better laws to protect bees that move through their states. Participants were invited to pick their favorite fruit, and then follow the bees as they travelled to the state that produced it most. Read their whole write-up here. This group focused on the MIT population of students, appealing to they sense of curiosity to motivate them to work on projects that might help bee colonies thrive. This interactive data sculpture invited participants to dip crackers in honey to find out about the volume of bee colony production in two different years. We don’t fully understand how bee colonies thrive and/or fail, which turned out bothers MIT students desire to understand everything! The projects across campus that were shared sparked folks who participated in the activity to get involved in the research. Read more in their write-up. All our data literacy and data culture work is grounded in real workshops with community groups, non-profits, governments and businesses. However, I am an academic working at a university, so I also publish papers and go to conferences and such. For any others in that vein, below is information about a Data Literacy workshop I’m planning with Catherine D’Ignazio and Firaz Peer at the Participatory Design Conference this August. This is part of larger our efforts to build a larger group of peers working on these topics, and translate our collective learnings for use with a non-academic audience! A workshop at the Participatory Design Conference, Belgium, Aug 21, 2018. Our goal in proposing this interactive data literacy workshop to the PDC audience is to offer it as a method that they can use to engage with those who are new to data and analysis. We hope to create connections between the PD discipline and practitioners within the data literacy space to learn from each other and inform this emerging field, to try to move the needle away from boring spreadsheet trainings conducted in dry online settings. We are interested in learning how our attendees define the term ‘data literacy’ within their own research and practice, and the tools, methods and techniques they use to operationalize it. In addition to demonstration of our methods, our workshop schedule also sets aside time for discussions and brainstorming of additional activities/techniques within this pedagogical realm. We would like to get a sense of what empowerment through data means to our participants and the communities they collaborate with. How can designers negotiate power and privilege differentials in relation to access and skills of working with data? We invite researchers, practitioners, activists, educators and designers who are interested in furthering the state of data literacy within their communities to submit short position papers (upto 1500 words). We invite researchers, practitioners, activists, educators and designers who are interested in furthering the state of data literacy within their communities to submit short position papers (up to 1500 words). We are open to a range of paper topics. For example, your paper might discuss how you conceive of data literacy or your research methods of choice. Your paper might discuss examples of data literacy and raise questions over what constitutes ethical engagement and empowerment. Your paper might outline uncharted territory in relation to identity, power and data literacy – including challenging the concept and emerging norms of data literacy. Or, finally, the paper might talk about interesting approaches to data literacy and how they might be made part of the workshop activities. Papers should be in the ACM format as suggested by the PDC organizers and should be submitted to the organizers before May 10, 2018. Final decision on acceptance will be communicated to the applicants by May 25th, 2018. Please email your position papers to firazpeer@gatech.edu. We expect to select a minimum of 10 and a maximum of 20 participants to take part in this workshop. Accepted participants will need to register for the workshop through the conference website. I’ve been connecting with more and more educators that want to take a creative approach to building data literacy with their students. Schools traditionally introduce data with in-class surveys and charting. This approach to generating their own data can be a wonderful way to empower learners to collect and represent data themselves. A more recent movement has centered around the STEAM movement – including the Arts along with the Science, Technology, Engineering, and Math curricular focus. I’m seeing a pattern at the intersection of these two approaches – educators are seeing strong engagement and results when they introduce their students to working with data through arts-based activities. Here’s a case study from a collaboration with the MIT Museum to flesh out how this can work. This case-study was contributed by Brian Mernoff, one of my collaborators at the MIT Museum. Each February, during Massachusetts school break, the MIT Museum runs a week of hands-on activities and workshops called Feb Fest. This year, the event was themed around our temporary exhibit, Big Bang Data, which explored how the increasing use of data affects technology, culture, and society. The purpose of the workshop was to let students view data sets of interest, understand these data sets, and share what they have learned with others in a creative and accessible way; all pieces of building their data literacy. As soon as students entered the classroom, they were asked to create a data sculpture based upon one of the sets of data placed at on their table. This is an activity the MIT Museum Idea Hub has already been running regularly. These data sheets contained relatively straightforward data sets to analyze, such as happiness in Somerville, and the cost of college over time. Art supplies were on the table, and the students worked with each other to create these sculptures while getting to know one another. After about half an hour each team presented how they decided to represent their data to the class. This activity was a great way to get them to get used to talking about data with each other and representing it in a novel way. After presenting the data sculptures, we began the main activity for the day. Students were given a list of websites (see below) that they could visit containing environmental data in either graphical or numeric form (see the Environmental Data Search worksheet). Once they had explored the websites, they discussed these websites with a second group of two at their table and determined which one of the links was most interesting to them to explore for the remainder of the project. Once the website was chosen, they again worked in their original group of two to find a story in one of the data sets on the website using the “Finding a Data Story” worksheet. After doing so, the two smaller groups recombined and chose which of the two stories they would like to tell in the final project. In their story, students needed to explain the problem the data connects to, what the data is and shows, why the data is important, what the audience of the story should do about it, and what would happen in the long run if the reader did what was suggested (see the Data Story Mosaic Layout worksheet). Beyond these physical artifacts, the students’ discussions about data were particularly impressive. One group brought up a very interesting question about rare bird sightings and proceeded to debate it for about 15 minutes. They noticed that certain areas of the United States had more overall sightings of rare birds. At the same time, they looked at another data set on the same website showing the number of reporting bird observers across the country. Combining these graphs, they noticed that more rare birds are spotted where there are more reporters. This brought up the question of whether or not rare birds are actually as rare as shown by the data if there is such a close relationship between the two data sets. Both sides of the debate made good arguments and they eventually settled on the idea that the data was still valid, but incomplete. They would need more experiments in order to say anything conclusively. This demonstrates that the learners were in the “data headspace”, thinking about standard questions of representation, outliers, and normalization. A second group, studying data on arable land, was trying to combine their data set with information on organic farming. This brought up good questions about what the terms “organic” and “GMO” actually meant, as well as whether or not it is related to the ability to reuse land over time. To their surprise, the students did some more research and realized that genetically modified foods and some types of “non-organic” farming actually increase what land can be farmed. Again, the activity pulled the learners into a space where they were curious and driven to understand the real-world approaches and impacts the data might be representing; making sure they understood what they had in front of them before finding a story to tell with it. Overall, these projects allowed students not just to analyze data to find trends, but to think about why data is important and it can be used to find solutions to problems. Through their mosaics, students explored and discussed different potential solutions to determine which one they wanted to communicate with a larger audience. Brian’s workshop is a wonderful example of how a creative arts-based approach to working with data can engage and proboke students in novel ways. It matches results we’ve seen in previous work on creating data murals with youth in Brazil, and working with a network of school on data challenges. These workshops are starting to help us build an evidence base for using the arts as an introduction to working with data. This can meet a larger set of students where they are. The physical artifacts and conversations around them are assets we use for evaluation and assessment. Are you an educator? We’d enjoy hearing how you are approaching this. Our partners at the Stanford’s Digital Impact initiative recently invited us to host a virtual roundtable discussion focused on building data capacity. In case you missed it, the recording and transcript are now online! We gave a quick background on the Data Culture Project. Then we tried a quick online data sculpture activity; asking participants to make and share a photo of a physical data story just using things they found around their office. From there we pivoted into a discussion of how the World Food Programme and El Radioperiódico Clarín are building capacity to work with data in creative ways. Andrés Felipe Vera Ramírez, Strategic Director at El Radioperiódico Clarín. We’ve officially launched the Data Culture Project and are excited to introduce you all to it! Our collaborators at Stanford’s Digital Impact program are hosting a virtual roundtable for us on April 12th. Join it to learn more about creative approaches to building a data culture within your organization! As part of it, we’ll be trying a hands-on activity online, and feature real stories from staff at two of our pilot partners – the World Food Program and El Radioperiódico Clarín. About a year ago we (Rahul Bhargava and Catherine D’Ignazio) found that more and more users of our DataBasic.io suite of tools and activities were asking this question — online and in workshops. In response, with support from the Stanford Center on Philanthropy and Civil Society, we’ve worked together with 25 organizations to create the Data Culture Project. We’re happy to launch it publicly today! Visit datacultureproject.org to learn more. Update: Join our webinar on April 12th to learn more!